Instagram is providing a way to share photo collages with a companion app called Layout, which—even though it was just launched today—is already getting employed in interesting ways by brands like Victoria's Secret and Sephora as well as numerous consumers. Within minutes of launching the app, an Instagram search for "#layout" resulted in post after post of photo collages from users testing out the new feature. Layout also lets people edit photos to create mirror effects and flip images. Even first lady Michelle Obama posted a collage within hours of the app's launch today. Additionally, there is a Photo Booth button that triggers a countdown for people to take multiple photos in quick succession, and they automatically are sent into a collage design. Layout marks the second complementary app from Instagram, following Hyperlapse, which debuted last August and sets videos to fast-motion speeds. Brands also immediately embraced Hyperlapse's video-effects app to show off fast-speed clips, and used it in their Instagram ads as well. 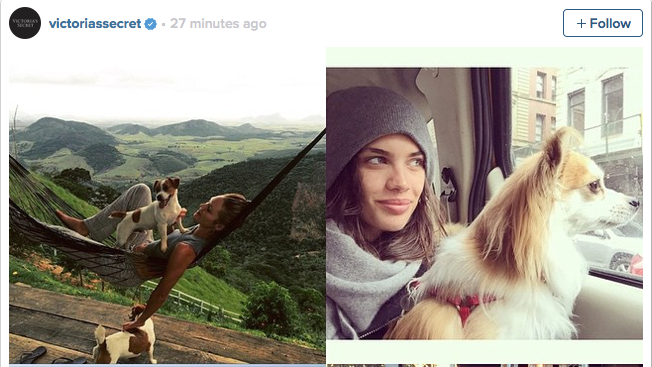 It's no wonder that marketers jump to attention when Instagram innovates. After all, the company's flagship mobile app has 300 million active users. As for now, brands and other people are experimenting with Layout's collages and mirror effects. Check out the following examples.